UFX is a broker that continuously moves forward, embracing new innovations and advancements. Bitcoin is just the beginning of what we have in store for UFX. UFX.com adds Bitcoin as a supported payment method. UFX traders can now fund their trading accounts by placing deposits with the cryptocurrency, Bitcoin, alongside MasterCard, Visa, Bank Transfer, and a wide array of supported online wallets. By supporting the world's most popular and widely used digital currency, UFX plans to widen its target base by offering an alternative to its current and future traders. With instantaneous transactions, the new payment method should streamline the deposit process, eliminating wait times, and allowing traders to trade as soon as possible. “UFX is a broker that continuously moves forward, embracing new innovations and advancements. 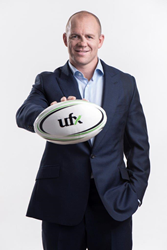 Bitcoin is just the beginning of what we have in store for UFX,” Dennis De Jong, UFX’s Managing Director. UFX was founded in 2007 and has grown into a leader in the online trading industry. The company is fully licensed and regulated and holds traders’ privacy and security to the highest standard. It’s easy to sign up for an account with UFX and even easier to start trading. Whether you’re a novice trader or experienced in the industry, UFX has all the tools you’ll need to get started.